Bakers hello again for the week! First and foremost I would like to say this blog is almost one month old! 🎉🎊🎉🎊 I know that’s not much but to me this is the world. I was so scared to start this blog and to make myself vulnerable but I’m glad to say that so far I am liking it and I truly appreciate all of you who take the time out of your day to look at this blog, it really means the world to me. I hope I get better at this as I’m still fairly new and hopefully I inspire some of you guys to try these recipes. Okay, enough of the mushiness and back to topic: With the weather getting colder I firmly believe the baked goods should get bolder in terms of size, flavor and comfort. 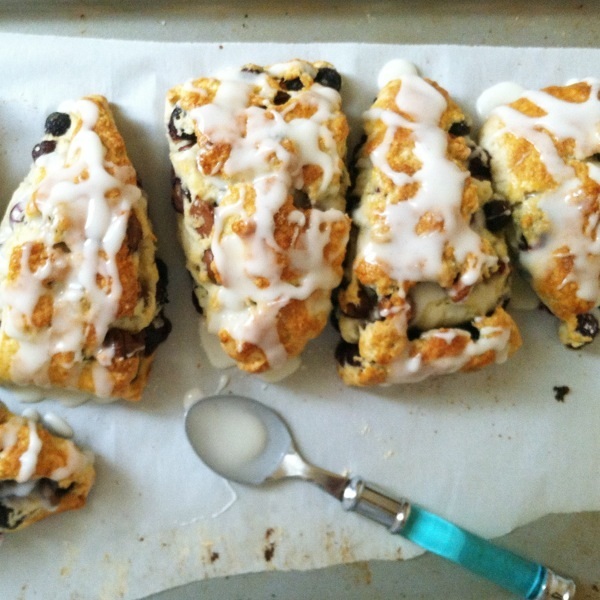 Have you ever had a scone? Please tell me yes, because if you haven’t your missing out. 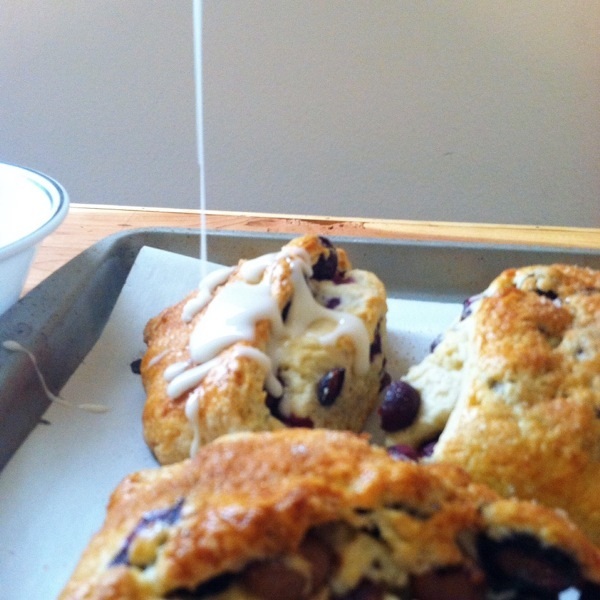 The only upside to that is the first scone you try can be at your own hands and is this winner. I’ve made this multiple times as my best friend/roommate always request them. She loves the little hidden bits of chocolate. Rolling in the Dough: Usually whenever I make scones I don’t try to be fancy, not only not with flavors but with appearance also, this time was a bit different, I wanted to try a method I saw online on Cupcakes and Cashmere’s blog. 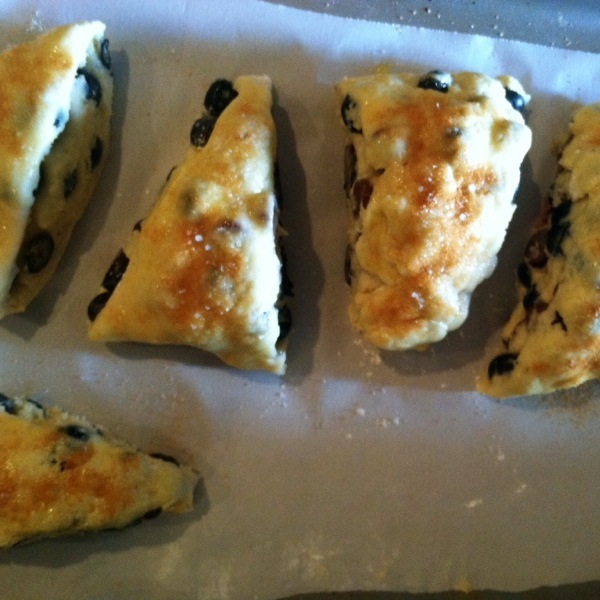 It’s not the same recipe but the way the scones looked was too cute not to try. I rolled out the scone dough, which is unusual because if anyone knows me they know I find rolling out anything to be a pain in the you know what, egg washed the open side, spread the blueberries and chocolate on and then rolled it up like a cinnamon roll, after that I cut it into triangles and it was honestly the cutest things ever, which shows it doesn’t take much to make me happy. Gotta have Flava: Now the flavor combination. Blueberries: for a good amount of time blueberries were buy one get one free at the supermarket I shop at and a girl could not refuse a sale on them. Whenever they’re in season I buy them in bulk and freeze them. If your using frozen berries do NOT thaw them out, they will bleed and unless your baking them for Halloween you don’t want that. I used chocolate because my roommate loves anything with chocolate, seriously, she never turns it down, so if you want and must you can omit it, but I don’t know why you would because it’s AWESOME with the blueberries. Ta-Ta For Now: Well that’s all from here. Tell me how are you liking the blog? Is there anything else you would like to know about or request. Please tell me, I want this blog to be something all of you would like to know how to bake or to learn more about also. Preheat the oven to 375 F and pre-measure out all ingredients. 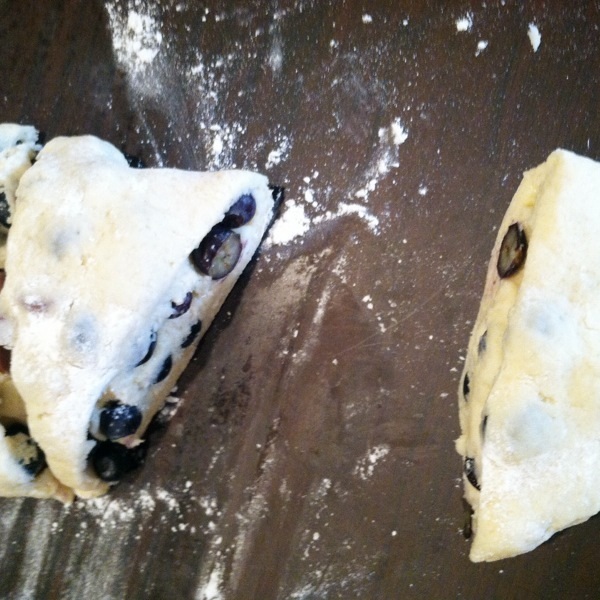 In a medium sized bowl, sift flour, sugar, salt, and baking powder then mix together. In a cup mix you milk and egg and set aside. 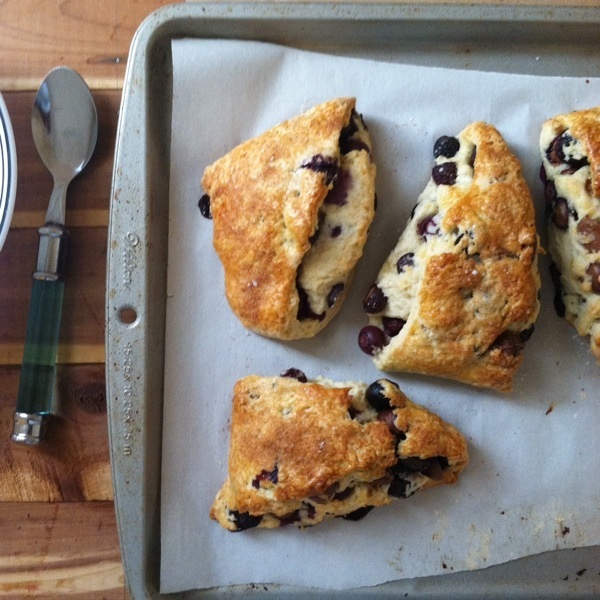 Add your blueberries and chocolate chips, and ration out whatever size scone you prefer. 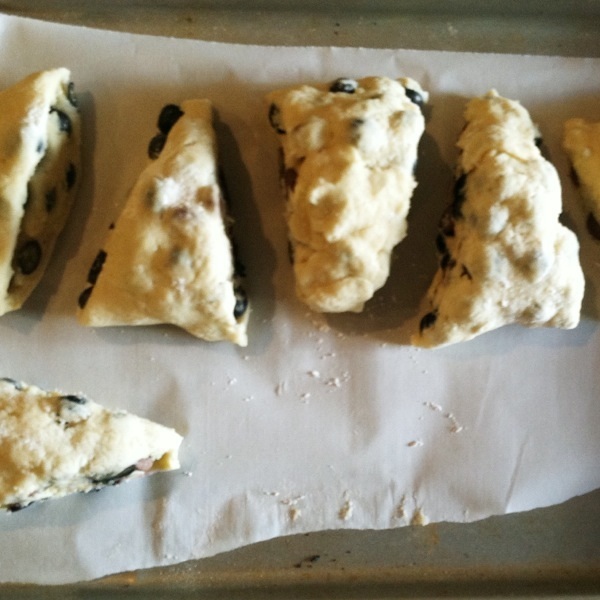 I usually mold it into a circle and start with four and cut those slices in half which yields 8 scones. 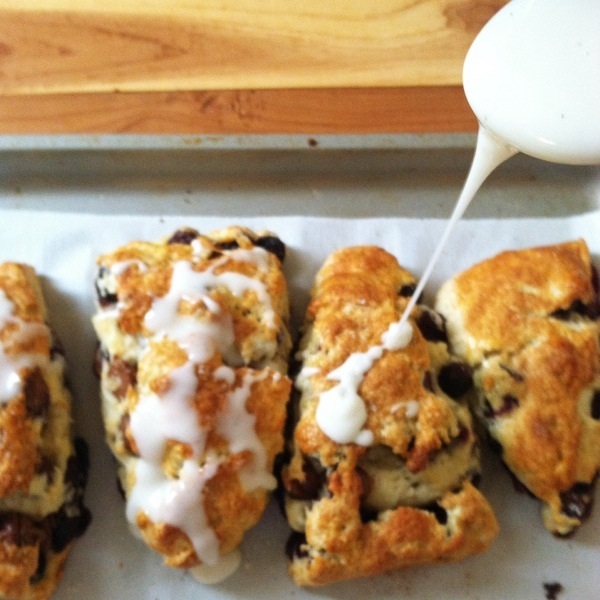 Optional – Roll the dough out into a long and somewhat even square, wipe an egg wash onto the open side of the dough and then add your chocolate chips and blueberries. Roll up your dough as if it was a cinnamon roll, cut into triangles and proceed to the next step. Bake for 15 – 20 minutes, each oven is different so yours may need a little less time or a little more time so check on it after 15 at least. Once cooled, you can begin your glaze. 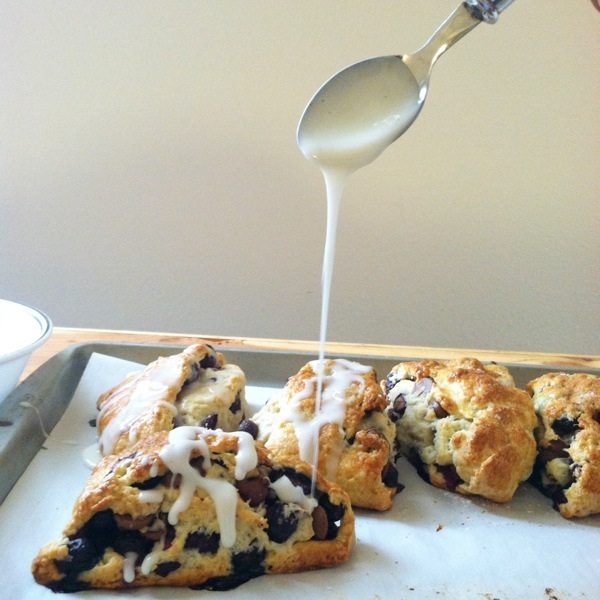 This step too is optional if you would rather jam or butter on your scones. Take some 1/2 c. powder sugar, 1 tsp. of vanilla paste and 2 – 3 tsp. of lemon juice and mix until the consistency is thick yet runny. 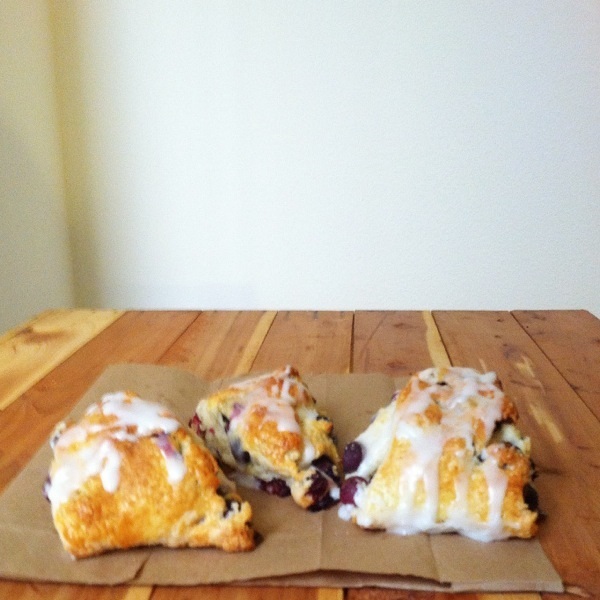 Now there is nothing to do except eat this scone and never picture your life again without it. Aw! that really means a lot! So glad you like it!